Before I start the review, I want to again THANK EVERYONE for their support and kind comments left on the blog and on Facebook. I can’t believe how much I have accomplished over the past year. It amazes me how helpful and wonderful everyone has been. Keep an eye out for another giveaway on Monday from Suzi Homemaker Embroidery! 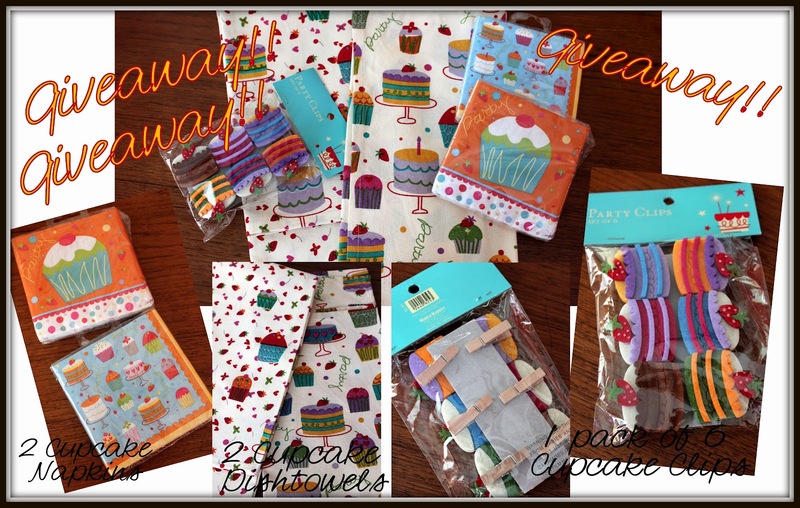 This is the last weekend to sign up for my Cupcake Kitchen Accessories Giveaway! Last week I reviewed the Pillsbury Cake Pop kit. 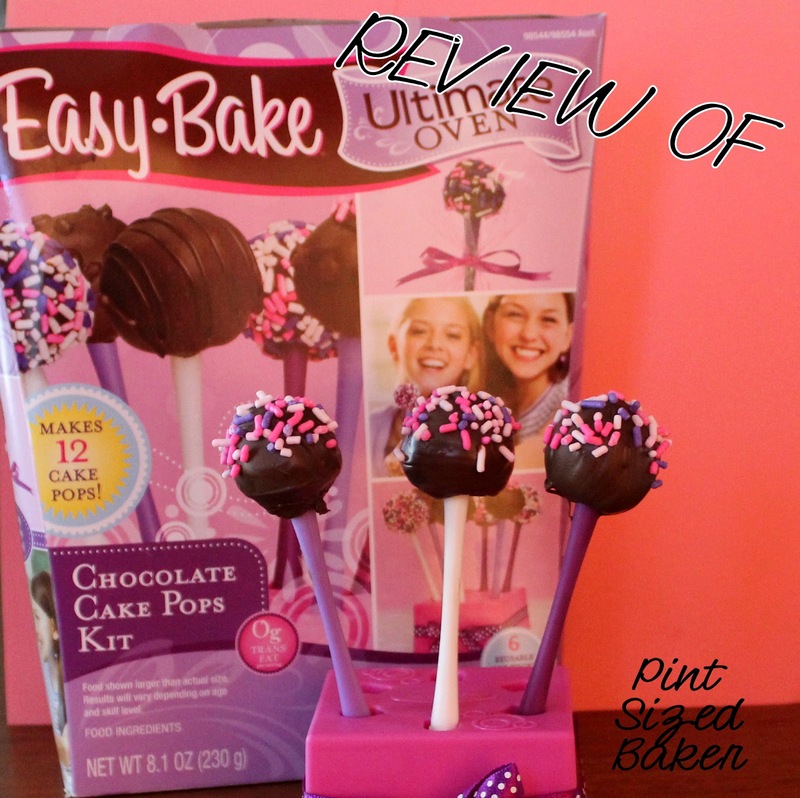 This week I am reviewing the Easy Bake Oven Cake Pop Kit. As a little girl, I was not fortunate to have had an Easy Bake Oven. My mom is not very “domestic”. She really doesn’t bake or cook or sew or do arts and crafts. She was a single mom and I guess my brother (and sometimes I) wore my Mom out. So, as a gift to my inner little girl, I bought the kit. 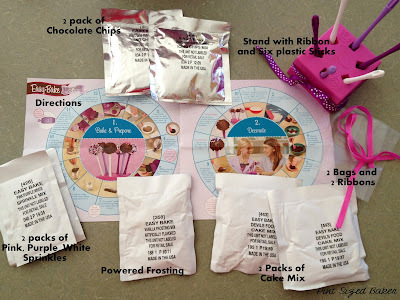 When I saw the Easy Bake Oven Cake Pop kit in Target, I was intrigued. I wasn’t sure if I could make this sans oven. I guess the little ovens are no longer cooking with a light bulb, so I googled “At what temperature do Easy Bake Ovens bake at?”. Thanks to Yahoo answers, it’s 375 deg F. Easy enough, I can make this at home without the entire system. Fifteen Dollars later, I was headed home with my Easy Bake Oven kit. The Cake Pop Kit is advertised to make 2 batches of 6 cake pops. Since I don’t have the Easy Bake Oven (boo hoo), I had to use a makeshift pan. I got my smallest toaster oven pan and then lined it with a smaller bit of foil. I added some water to the cake mix and baked it. I admit, I didn’t have the correct sized pan, so some of the thinner edges got a bit crunchy. I removed those hard bits and crumbled the remaining cake. I added some water to the powered frosting, mixed it up and added it to the crumbled cake. Man, they do NOT give you a lot of frosting to work with. I used my cookie scoop to measure my cake balls, however, I had to split up the balls and make them smaller than I normally would make them. I only ended up with 4 cake balls. Their chocolate melting directions were to add the chocolate chips to a baggie and then submerge the baggie into hot water. This actually worked very well as a makeshift double boiler. 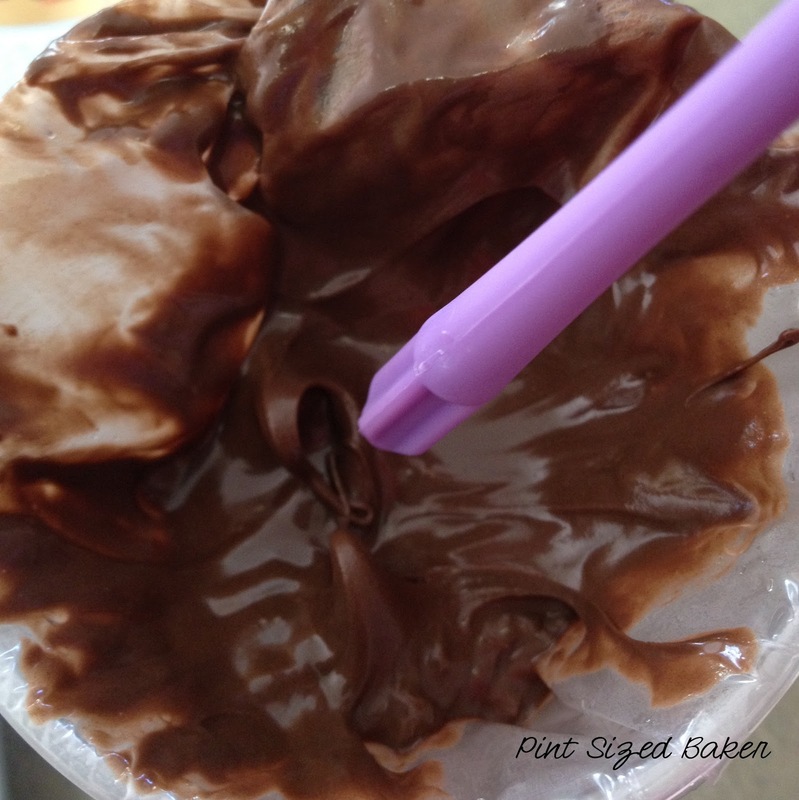 I didn’t really like the rest of the directions to leave the chocolate in the baggie in the cup and dip into that or off of a spoon. Also, Chocolate and Water DO NOT MIX!! If the water gets into the chocolate, it will seize the chocolate and then the chocolate is trash. Another thing I did not like were the plastic sticks. The tips are thick and have four prongs that extend out of the stick. My problem was that the pops were small and dry and inserting this blunt stick into them was not ideal. My smallest cake ball completely fell apart on the first attempt. I had to re-roll and re-stick it. This could lead to some minor frustrations for girls. The third frustration came to dipping the cake pops. There was minimal chocolate to coat the cake pops. I’m not sure how I was supposed to dip 6 pops when I could barely dip 4 pops. And the last cake pop stuck to the baggie and fell off the stick when I removed it from the chocolate. Ultimately, I ended up with three cake pops. I did not try to bake the second pouch of cake mix. 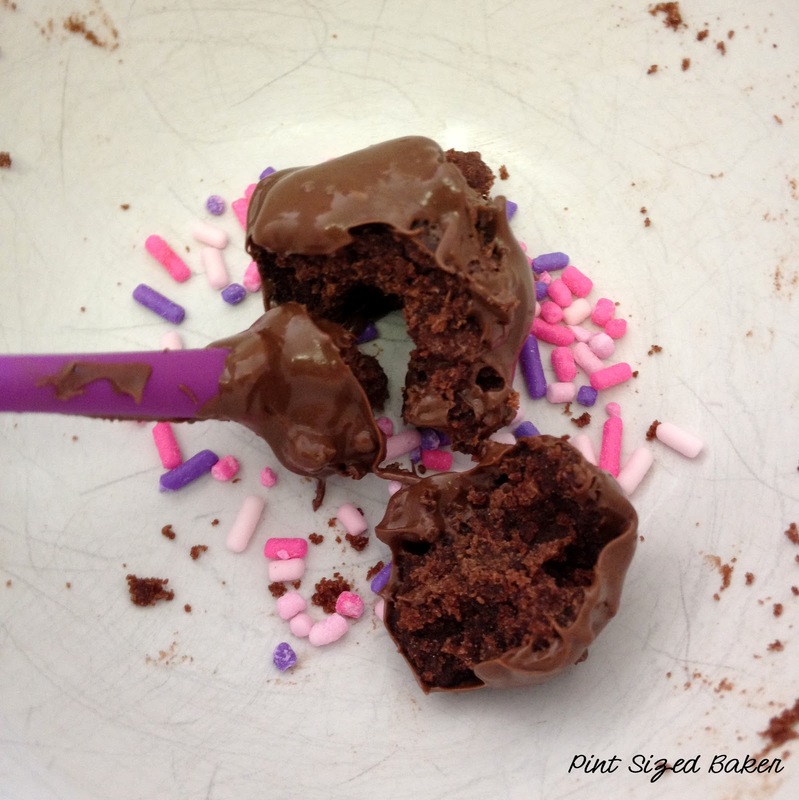 – There was not enough frosting for the amount of cake resulting in a dry, crumbly cake ball. 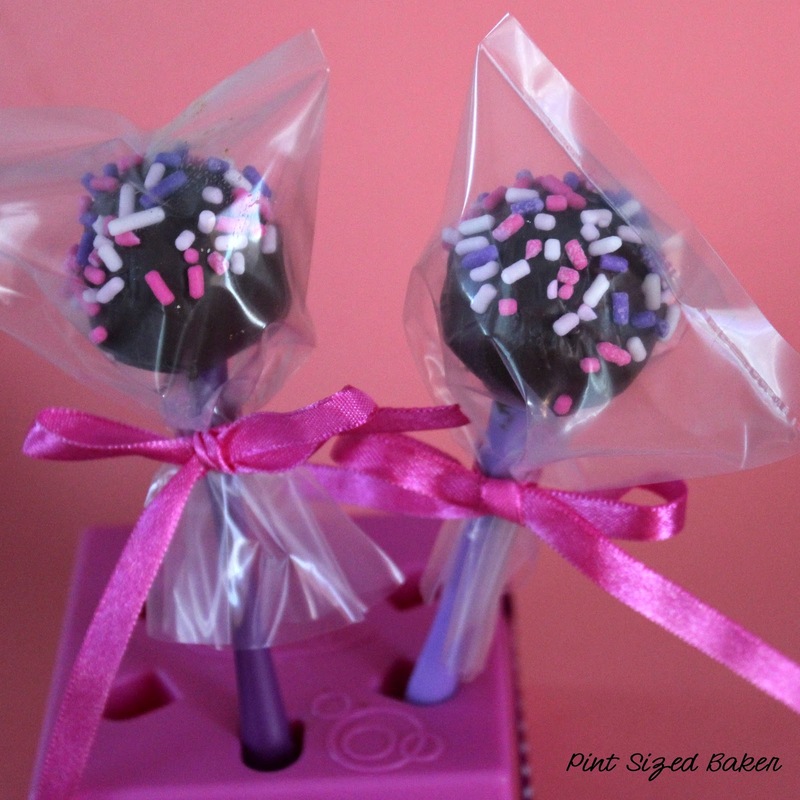 – Blunt sticks caused more damage to cake balls making it difficult to insert stick and adhere to cake ball. 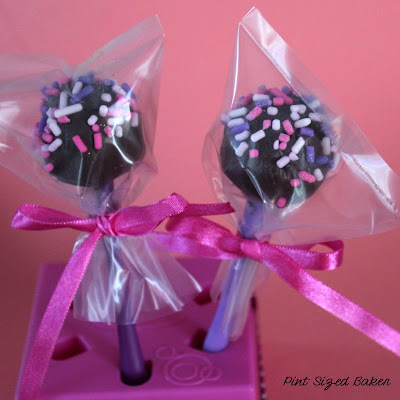 – Not enough chocolate chips for cake pops. – Only 2 baggies. I guess the girls eat 4 now, and save 2 for later. But what about the next 6 in the kit? Here’s my advice to Mom’s who will inevitably be making these cake pops with their daughters. 1. Use the Easy Bake Oven. Hopefully, you’ll have a full cake to work with. 2. Have some extra vanilla frosting on hand to add to the batch. 3. Have some extra chocolate chips to melt to coat the cake pops. 4. Do not leave the melted chocolate in the baggie. Put it into a tall, skinny glass to allow dipping straight down and back up again. 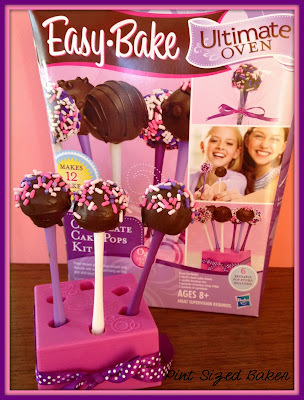 If you do have an Easy Bake Oven and have made these, I would love to hear about your experience. Finally, I would not recommend this Cake Pop Kit to any of my friends. Humpf!!!! Just FYI…Your Mom does do some crafts!! I believe you have a few of them decorating your home!!! But somehow, despite her faults, you turned out great!!!! Love You!!! Sorry Mom. I know you do your cross-stitch work and it is lovely. I love you, too! Too funny! I've been caught by mom too saying things about her lack of cooking. She always reminds me that she cooked when we were little, but gave up by the time we were actually old enough to remember any of her cooking. Four kids all wanted something different, so we ate from a microwave for years after. Lol, I totally loved my Easy Bake oven until it caught on fire. Oops! These are so cute! Caught on FIRE??? Yikes. That wasn't good. I hope nothing else caught fire. I'm very happy that the incident did not scare you off from baking. That would have been tragic. Sounds like a lot of bother for little reward! My kids love the easy bake oven!! Great post! Cute! I've never seen this kit! My all time favorite cupcakes are triple salted caramel cupcakes! Hmmmm, good to know. Thanks for reviewing it! Aawww so many memories of the easy bake oven!! This is great! Your mom's comment is hilarious by the way! haha! Oh, my gosh, I love the note from your Mom! YOU GO MOM! Very funny! Thanks for bringing your easy bake oven pops to ON THE MENU MONDAY! What a good daughter to leave up her comment! I got a very good chuckle! wow you are brave! They look cute but I so would have lost patience! That looks really fun! You're never too old to have a happy childhood! Oh, how I miss using the easy bake oven. I definitely would have lost patience with this project though. They do look adorable though. Too funny getting caught by Mom, lol. My daughter (at 18) would STILL use an Easybake if I let her. They are too cute. Thanks for the info on the product. Always good to know before shopping. Thanks so much for linking up to Creative Thursday. Can’t wait to see what you share this week. Have a great week. I only WISH I had seen this review BEFORE I made these with my granddaughter 🙁 This was the most frustrating, annoying, and maddening activity,, that I have ever attempted! 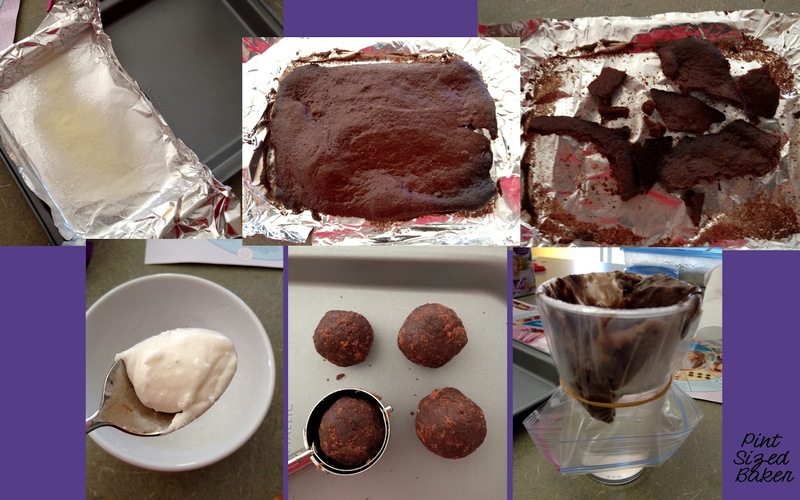 …and we HAD an Easy Bake oven to use!! I agree that the cake crumbles easily. There is DEFINITELY not enough frosting to do as instructed. The chocolate get s hard in about 15 seconds, so there is not time to "roll" ANYTHING in it! We ended up with only 4–ish pops, only a dab of hard as a rock "frosting" on each (sort of) and it was just one huge MESS!!! I will never, ever, ever, ever, ever, ever, ever, ever, EVER, EVER, EVER, EVERRRRRRR, ever, EVER, make cake pops again, in an Easy bake oven!! EVER!!! UGH! !